Attention is how we relate to the world and what we attend to determines what we see. At this stage in my life I am interested in how I can ensure that what I choose to attend to doesn’t blinker me to the possible implications of attending too closely to a given idea. The balance between focussing and keeping a broad perspective often seems elusive. I’m not sure how this can be achieved, other than to be aware that there is probably always an alternative perspective and there may be things I am missing. But recently the focus of my attention means that I am noticing that a number of authors seem interested in similar ways of thinking. Most recently my attention has been drawn to a podcast (via Mariana Funes) in which Chris Richardson interviewed Ulises Mejias, author of Off the Network. I am already familiar with Mejias’ work having cited him in a paper co-authored and published with Mariana early last year. In the podcast Mejias tells us that he and his co-author Nick Couldry have written a new book, soon to be published, in which they reflect on how the conversation has shifted since he wrote ‘Off the Network’. At that time, pre-Snowden and Cambridge Analytica, few people were interested in critical studies of the internet. Now there are many articles being published that are critical of the network. Mejias likes the direction things are going but still has some concerns. Whilst noting that attention has shifted from believing that companies such as Facebook, Twitter, Google and Amazon can do no wrong, to thinking that they need tighter controls and regulation, he doesn’t believe that this can be done by throwing more technological innovation and more algorithms (which are becoming increasingly complex) at the problem. In their new book Mejias and Couldry consider ways in which to unmap the network and un-think these technological determinisms. They question what happens when networks no longer promote agency but instead become templates for organising and structuring society. Mejias believes that a lot of our social biases are being mediated through our social devices and that we don’t even think about this. We carry smart phones and pay our internet bills, but what goes on behind the scenes is opaque and invisible. It is this idea of what is invisible that interests me. What are the implications of what is invisible for how we live and learn? What are the implications of not being able to see the whole picture? Mejias’ argument is that in this digital age if you are not in the network, you are invisible, you are ‘Other’. This he calls ‘nodocentrism’ – a way of thinking that becomes so dominant that it erases all other ways of thinking, ‘the rendering illegible of everything that is not a node’ (p.10 Off the Network). The network can only see nodes and only recognise other nodes. Mejias suggests shifting our focus to the spaces between the nodes and between the lines in a network. This space is important. It is not empty, and it can influence the network, although in this interview Mejias didn’t explain how. Does the invisible actually connect the nodes in some way? This reminds me of questions and discussions about the influence of observers (called ‘lurkers’ by some) on the web. What might the influence of the invisible be? Iain McGilchrist also writes about the spaces between, but in a different context. Mejias’ concern is with nodocentrism and that the invisible ‘Other’ is not ignored but acknowledged. McGilchrist’s concern is with the meaning of our lives and that we underestimate that we are not atomistic. In an interview with Rebel Wisdom he says: ‘There is no way in which I exist independently of all of you and all of the planet and of all of the people who came before me, and indeed in a strange way I am part of something that is to come. That is all not in me or in them or in some sort of gaps between us but is in the betweenness’. For McGilchrist the spaces between are critical for meaning. He uses two examples to explain this. The first – an electric current. He says: An electric current is manifest between two poles, a positive pole and a negative pole; it’s not in the positive pole, it’s not in the negative pole, it’s not even in the positive pole plus the negative pole, nor is it in the space between the two poles, because that space is nothing. It’s in the whole betweenness of the two poles and what that brings about at a wholly different level. So, for McGilchrist and for Mejias, the spaces between, whilst invisible, are redolent with meaning and highly significant to our understanding and knowledge, just as the empty space in atoms, which makes up 99.9% of their structure is significant to our understanding of matter. 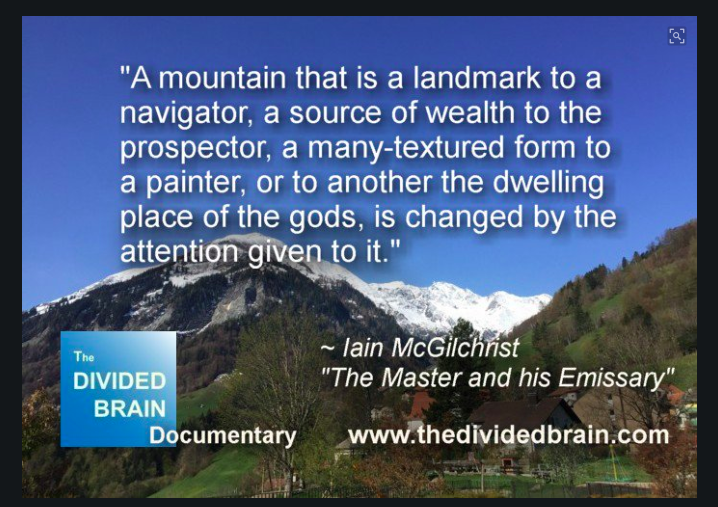 Both Mejias and McGilchrist believe in the importance of being willing and able to recognise the invisible ‘Other’ – that the invisible ‘Other’ makes a significant contribution to our lives, knowledge and understanding; without an understanding of the ‘Other’ we cannot see the whole. …. the self originates in the interaction with ‘the Other’, not as an entity in atomistic isolation: ‘The sense of self emerges from the activity of the brain in interaction with other selves’ (p.88). Mejias believes that there are things we can do politically to address this; choices are important; research will have to become more open. It’s something we need to do for ourselves. McGilchrist believes that we need to access the world beyond words. The world ‘beyond’ ourselves (p.399, The Master and his Emissary). In the Rebel Wisdom interview, he says he thinks we can actually change things, but we each have to take it upon ourselves to be part of the change. The strong message from both these authors seems to be the need to recognise that we may not be seeing the whole picture, either on or off line and that we should be open to the ‘Other’. It may be that I am making links between these two authors where they don’t exist, or which don’t resonate with readers of this blog post. Perhaps the focus of my attention is such that I have failed to see the whole picture, which would be ironic. It is difficult to access a world beyond words. But sometimes words do resonate. 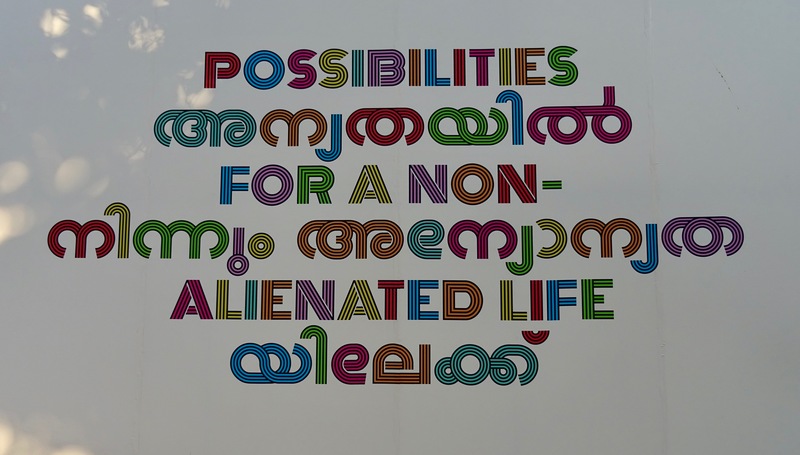 To end this post, here is a quote which I saw at the Kochi Biennale (Fort Kochi, Kerala, India) earlier this week, which serendipitously also references the ‘Other’, but in another context. Virtual hyper-connectivity has paradoxically alienated us from the warm solidarities of community; that place of embrace where we can enjoy our intelligence and beauty with others, where we can ‘love’; a place where we don’t need the ‘other’ as an enemy to feel connected. Imagine those pushed to the margins of dominant narratives speaking: not as victims, but as futurisms’ cunning and sentient sentinels. And before speaking, listening to the stone and the flowers; to older women and wise men; to the queer community; to critical voices in the mainstream; to the whispers and warnings of nature. On this last day of 2018 I have spent some time, here in Kerala, under blue skies and in beautiful surroundings, reading an interview that Jonathan Rowson conducted with Iain McGilchrist in 2013. It struck me that the article has many messages for how I might wish to progress into 2019. Here are some quotes that seem apposite to the time of year and maybe more broadly. Since I am on an expensive foreign holiday, a month in India, it’s not surprising that this passage caught my attention. Of course it’s possible to criticise McGilchrist’s use of ‘we’, question who ‘we’ refers to and feel uncomfortable with the generalisation, but nevertheless, for me, there is some truth in this. I don’t find my home in the UK alien, limiting or sad, but I do feel more relaxed here in Kerala than I have for years, so it’s interesting to reflect on why this is and what could be changed at home to replicate this feeling. These sentences also strike me as having truth in them – words to hold on to through next year. All these quotes resonate with me on one level or another and seem worth thinking about as 2019 is almost upon us. 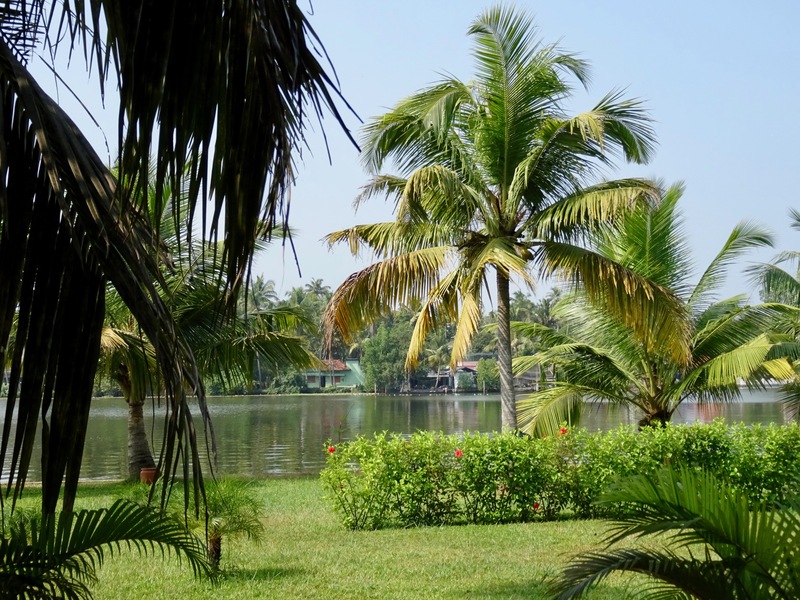 As I write this, it’s 8.30 pm here in Kerala and sitting here on the veranda of our homestay, the homes across the water are competing for which one can play their celebration music the loudest. 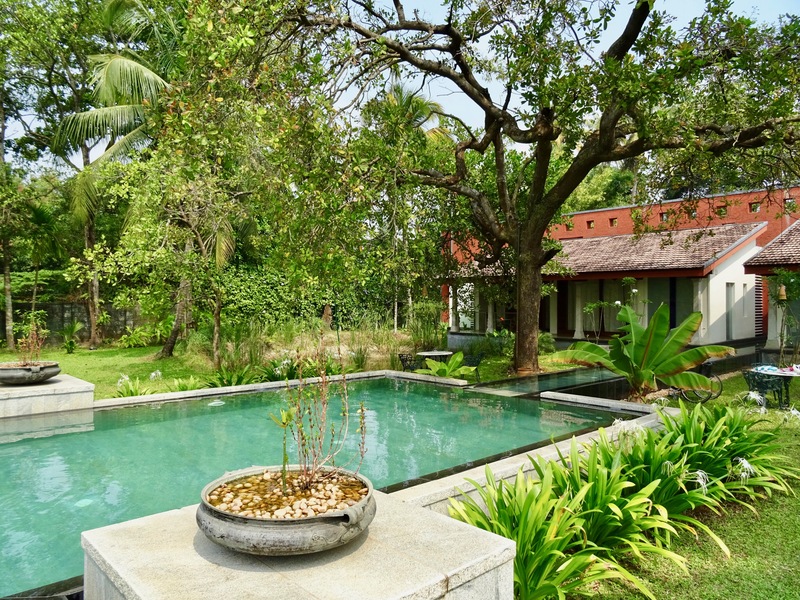 But this small coastal community here in Kerala, when it is not New Year’s Eve, is a great example of a place with a more natural, a slower, more meditative, tempo. Wishing anyone who reads this a happy and fulfilling 2019. This morning I found Anthony Wilson’s blog post in my inbox – Reasons why I am happy to be in the city at the end of December. I enjoyed his post, but I am so pleased not to be in the city, and in Kerala. Here are my reasons (with thanks to Anthony Wilson for prompting this effortless post). 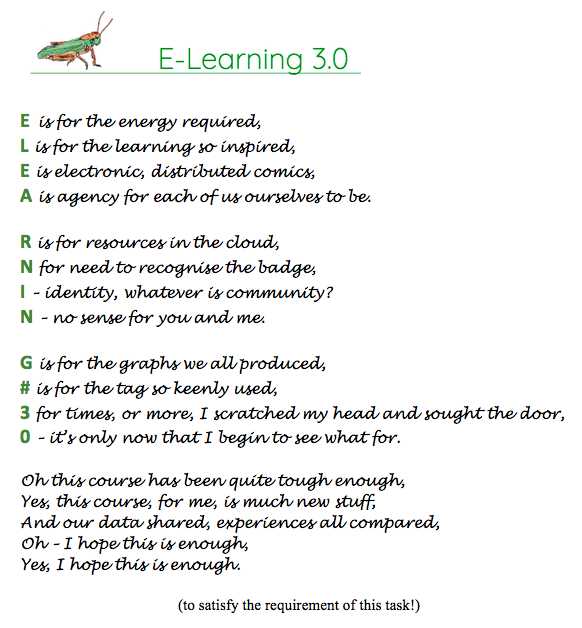 Although the final week of the E-Learning 3.0 course is almost over, I haven’t yet finished thinking about the penultimate week on Experience. The guest speaker for this week was Amy Burvall. I really enjoyed her conversation with Stephen Downes. The recording is below. Amy is a creativity expert, who tries to ‘make’ something every day. She believes in remix as a culture, transparency of work and multi-media work and has a website and many videos to prove it. She has published a creativity handbook for teachers, which has recipes for creative thinking and has been designed to be remixable. Teachers are encouraged to take a prompt, work with it and share it with a given hashtag. Interestingly, Amy said that a community was growing around this hashtag, which is what Stephen thought could happen around the #el30 hashtag for this course, when the topic focussed on community. Stephen sees creativity as pattern recognition and Amy suggested that creativity is being able to see juxtapositions and relationships that others don’t. Both these ideas fit with my experience. Amy also believes that constraints help creativity and that learners should be encouraged to articulate why they made what they made. I’m not sure about this. Whilst I can see the value of articulating learning processes for the learner, a part of me says that a work of ‘art’ should be able to speak for itself, and doesn’t need to be accompanied by the artist’s explanation, but I think it depends on what the work of art is. 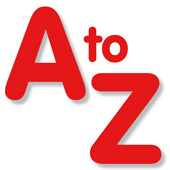 A question has just entered my head – Is art that is created online, using technical tools, always conceptual art? This question feels significant to me, but at the moment I can’t put my finger on why. For Amy a computer can create art, but she asks where is the backstory that touches her heart and makes the emotional connection. I think this is why she feels that learners should be encouraged to explain their art. She says we are craving experience rather than stuff and agrees with Stephen that the creation of the content is part of the content. I can see that the creation of content is part of the content and that art should touch the heart and make an emotional connection, but I am still not convinced that this needs articulating. Serendipitously in the same week that I listened to Amy’s conversation with Stephen, I listened to a podcast of a conversation between John Cleese and Iain McGilchrist (the first night podcast), who also talked about creativity, but in different terms. They started by bemoaning the fact that creativity for comedians is being constrained by political correctness and that they can no longer make fun of people. (John Cleese stressed that this should be in an affectionate, not in a nasty way.) For John Cleese, all humour is about human imperfection, and is needed because we are not good at laughing at ourselves. All humour is critical. You have to be creative to be a comic. Artists let go and let things happen. Creativity is non-intellectual and unconscious. Moments of insight come out of the blue. You can’t create to a schedule. The moment you have an idea, allow the creative idea time. A new born idea needs time to grow. Creative artists know how to play and take longer to make their minds up. It’s a healthy habit not to give snap answers. There’s wisdom in I’ll just sleep on it. Amy Burvall also talked about negative capability and living with ambiguity and uncertainty. She said creativity is a way of being, a way of approaching the world. We should live like an artist, dance as though nobody’s watching, and kill that internal editor! I think John Cleese and Iain McGilchrist would agree. Stephen has provided some great resources for this topic which I am copying here as I still have to catch up on quite a few of them. I can again particularly recommend his summary Feature Article. 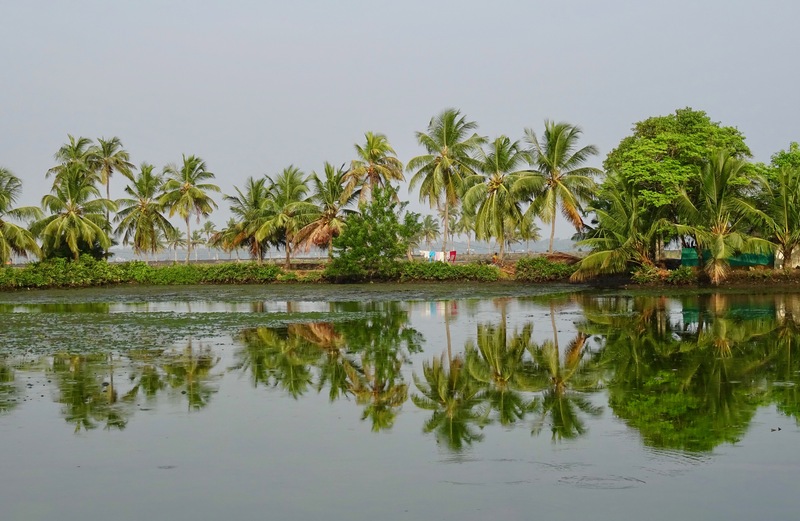 *Note about the photo: Backwaters Kerala. This is my current location for the next three weeks, which also explains why I am a week behind on the course! The challenge for educators and for society in general will be in managing and accepting the transition from emphasizing ‘what people learn’ to ‘how people learn’. Like the creative process itself, what’s important is not what is created – it could be anything from a cake to a cathedral – but rather how it is created. It is the history, process and provenance of the creation that gives it meaning, relevance, and ultimately, truth. The following pages represent a comprehensive summary of current research and theory on the sources of innovation and creativity, both in individuals and organizations. Based on the recurring concepts in the existing literature, the paper concludes with some recommendations for how education systems can best foster these attributes in students. This is the musical accompaniment for the verses below. Please sing along. For the introduction to this week’s topic, see Stephen Downes’ Synopsis. I posted my initial response to this text in a previous post – Creativity and Experience on the Distributed Web. See also Kevin Hodgson’s post for one example of how to respond to this task. Stephen wrote: “Here’s a good example of the sort of thing you could create, by Kevin Hodgson (who apparently also studied mind reading as he completed this Task before it was posted).